The benefits of Yoga are well touted, but have you heard of Office Yoga? No? You’ve come to the perfect place to read all about it. While you’re at it, book us for this super relaxing activity for you and your office peeps. You’ve probably heard about chair massage and how beneficial it is for a stress free, productive work environment. You’ve wanted to enjoy these same benefits but for various reasons aren’t really feeling like you want to go the chair massage route. Enter Office Yoga! Yes, the popular beneficial mindful practice of yoga has made its way into the workplace. 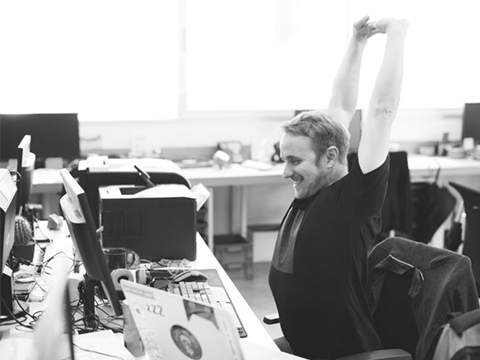 Not only does Office Yoga offer a way for you and your coworkers to de-stress while on the job, it also improves your focus, keeps your blood circulating (while sitting for extended periods of time) and restores your energy. The best part? Office Yoga can be done in the office even at your desk…no sweat involved! How exactly is Office Yoga done? Office Yoga employs a specific sequence of breathing, stretching and seated poses. The sequence is designed to awaken the nervous system and get you over the midday slump many employees experience at one time or another. Those that have engaged in Office Yoga have confirmed how relaxed they’ve felt and how easy it is to incorporate into their daily work routine. Ready to partake in the awesome benefits of corporate relaxation? Spa Flow has you covered! Contact us today to book your “must have” activity for in office stress relief! We travel through Washington DC, Virginia, Atlanta and Philadelphia. ~PS: Here at Spa Flow, we’re totally into empowering our clients to Feel Better. Work Better. Be Better. 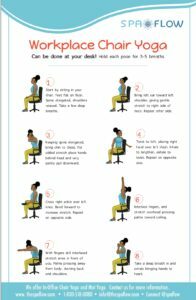 Go ahead and click the image below (feel free to print for quick access) and get a little intro into Workplace Chair Yoga. It’s our gift to you!